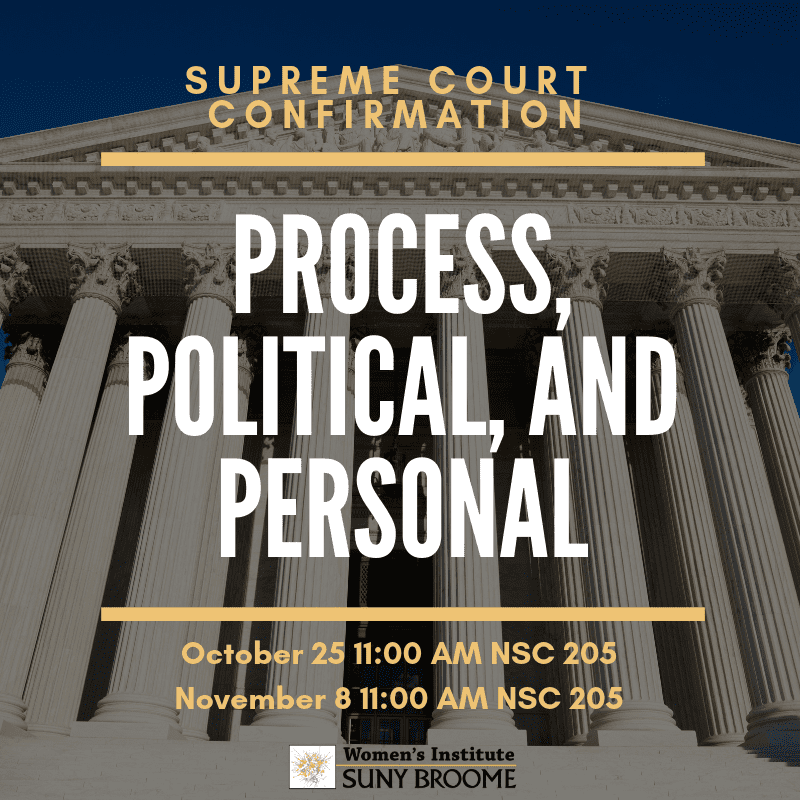 Do you have questions, thoughts, frustrations about the U.S. Supreme Court confirmation process for Judge Kavanaugh? It has played out on national news, social media, and political rallies, but information overload does not always help us understand the complexity of issues and the extent to which they affect us as a democratic society. The process has affected many on a personal level as accusers and accused came forward to tell their stories. What does it tell us about our democracy? What does it tell us about our own private lives and personal traumas? How can it inform our decisions both personal and public going forward? A group of faculty from SUNY Broome’s Women’s Institute began asking these same questions, drawing from diverse areas of expertise including law, political science, performing arts, literature, information technology, nursing, counseling, education and psychology. Grappling with the profound political processes and the social and personal ramifications of this confirmation requires critical thinking, civic discourse, a sharing of professional and personal perspectives. Making sense of this type of complexity is, in fact, exactly what higher education hopes to accomplish. Come explore these questions with us. Our dialog is not complete without the voices of our students and colleagues. We would like to know your thoughts on the process, your experiences in gleaning information from social media or from more formal news sources, and how this has affected you personally. We will offer some answers from our areas of expertise, but we hope to come together for dialog and discourse and to learn together from our shared experiences and our differences. We hope participants will leave the sessions with a broader perspective, a deeper understanding of the political process, and a sense of personal and professional support from within our SUNY Broome community. The first session, Process and Political, will run from 11 to 11:50 a.m. Thursday, Oct. 25, in NSC 205. It will focus on the U.S. Supreme Court nomination process, the political setting in which it took place, and the role of citizen voice in the process. The second session, Personal, will run from 11 to 11:50 a.m. Thursday, Nov. 8, in NSC 205. It will look at the effect of this process on individual lives (of the accused and the accuser), its relationship to the #metoo movement, and the effect of such explosive public hearings on survivors of sexual assault. It will also ask how all people committed to respect should interact with one another moving forward.